Audrey J. Weiss, Ph.D., Anne Elixhauser, Ph.D., Jaeyong Bae, M.A., and William Encinosa, Ph.D.
Hospital stays involving ADEs have been reported for a range of drugs, including hormones, analgesics, antibiotics, and cardiovascular drugs, among others.9 Adverse drug events may be a reason for admission to the hospital—that is, the ADE was present on admission (POA). Alternatively, ADEs may originate during the hospital stay because of medications administered during hospitalization. Adverse drug events are the most common nonsurgical adverse events in hospitals.10 In 2008, about 14 percent of Medicare patients experienced an adverse event originating during their hospital stay, costing an estimated $3.8 billion a year, with about a third of the events being ADEs.11 This Statistical Brief presents more recent data on national ADE rates over all payers in 2011. In 2011, adverse drug events (ADEs) in U.S. hospitals were three times more likely to be present on admission (388 per 10,000 discharges) than to originate during the hospital stay (129 per 10,000 discharges). The most common general causes of ADEs that were present on admission (POA) were antibiotics and anti-infectives (23.4 percent of all ADEs), systemic agents (13.6 percent), nonspecific ADE causes (12.9 percent), and hormones (11.9 percent). The most common general causes of ADEs that originated during the stay were antibiotics and anti-infectives (28.0 percent of all ADEs), nonspecific ADE causes (16.6 percent), hormones (16.1 percent), and analgesics (12.6 percent). Overall, the most common specific ADEs were related to clostridium difficile infection (95 per 10,000 discharges), antineoplastic drugs, and steroids (each at a rate of 57 per 10,000 discharges). Almost all ADEs were more likely to be POA than to originate during the stay. The largest differences were observed for antidepressants (17.6 times more likely to be POA) and central nervous system drugs (13.5 times more likely to be POA). ADEs due to CNS depressants and anesthetics were nearly two times more likely to originate during the stay than to be POA. Antibiotic-related ADEs were equally likely to be POA as to originate during the stay. Across a total of 20,172,966 discharges in the 32 States included in our analysis, there were 782,757 ADEs that were present on admission and 259,662 ADEs that originated during the hospital stay. Table 1 presents the rate and percentage of ADEs for a range of causes. Overall, ADEs observed during hospitalization were more likely to be present on admission (388 per 10,000 discharges) than to originate during the hospital stay (129 per 10,000 discharges). Among ADEs present on admission, the most common general causes were antibiotics and anti-infectives (23.4 percent of all ADEs), systemic agents (13.6 percent), nonspecific ADE causes (12.9 percent), and hormones (11.9 percent). Among ADEs that originated during the stay, the most prevalent general causes were antibiotics and anti-infectives (28.0 percent of all ADEs), nonspecific ADE causes (16.6 percent), hormones (16.1 percent), and analgesics (12.6 percent). Abbreviation: NSAIDS, nonsteroidal anti-inflammatory drugs. a General ADEs are in bold; specific ADEs are indented. b The sum may be greater than 100% because some hospital stays may involve more than one ADE. Source: Agency for Healthcare Research and Quality (AHRQ), Center for Delivery, Organization, and Markets, Healthcare Cost and Utilization Project (HCUP), State Inpatient Databases (SID) for 32 States, 2011. The general causes of adverse drug events that were present on hospital admission and those that originated during the stay are provided in Figure 1. The order of the list is from the most to least frequently occurring cause overall. 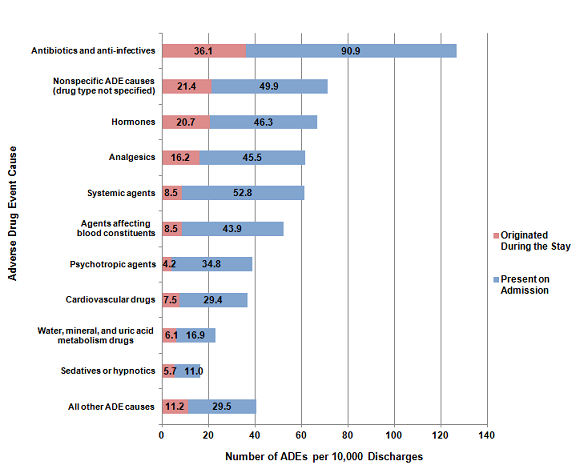 The most frequent general causes of ADEs were antibiotics and anti-infectives (127 events per 10,000 discharges), nonspecific ADE causes (71 events), hormones (67 events), and analgesics (62 events). Across all general causes, ADEs were substantially more likely to be present on admission than to originate during the stay. Figure 1. General causes of adverse drug events, 2011. This is a stacked bar graph, showing the number of adverse drug events per 10,000 discharges by the cause of the adverse drug event, for those that originated during the stay and those that were present on admission. Antibiotics and anti-infectives: 36.1 originated during the stay and 90.9 were present on admission. Nonspecific adverse event causes, drug type not specified: 21.4 originated during the stay and 49.9 were present on admission. Hormones: 20.7 originated during the stay and 46.3 were present on admission. Analgesics: 16.2 originated during the stay and 45.5 were present on admission. Systemic agents: 8.5 originated during the stay and 52.8 were present on admission. Agents affecting blood constituents: 8.5 originated during the stay and 43.9 were present on admission. Psychotropic agents: 4.2 originated during the stay and 34.8 were present on admission. Cardiovascular drugs: 7.5 originated during the stay and 29.4 were present on admission. Water, mineral, and uric acid metabolism drugs: 6.1 originated during the stay and 16.9 were present on admission. Sedatives or hypnotics: 5.7 originated during the stay and 11.0 were present on admission. All other adverse drug event causes: 11.2 originated during the stay and 29.5 were present on admission. Source: Agency for Healthcare Research and Quality, Center for Delivery, Organization, and Markets, Healthcare Cost and Utilization Project, State Inpatient Databases for 32 States, 2011. Figure 2 presents the 10 most common specific causes of adverse drug events. The data represent causes that occurred at a rate of more than 15 per 10,000 discharges. Clostridium difficile infection was the most common ADE cause, occurring at a rate of 95 per 10,000 discharges. The next two most frequently occurring ADE causes—antineoplastic drugs and steroids—each occurred at a rate of 57 per 10,000 discharges. With the exception of antibiotics, all of the most common specific causes of ADEs were more likely to be present on admission than to originate during the hospital stay. 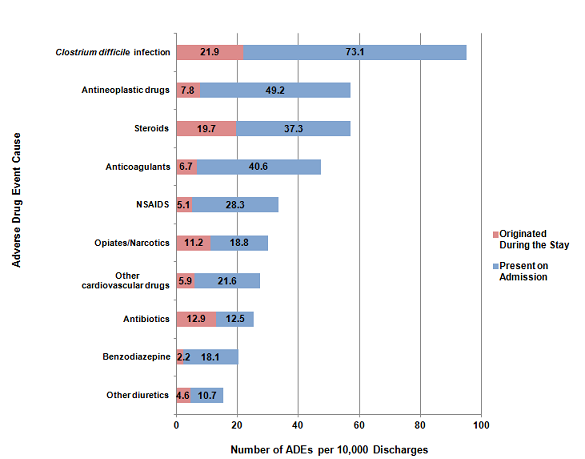 For antibiotics, the number of events was nearly equal across the settings: 12.5 ADEs per 10,000 discharges were present on admission versus 12.9 ADEs that originated during the stay. Figure 2. Ten most common specific causes of adverse drug events, 2011. This is a stacked bar graph, showing the number of adverse drug events per 10,000 discharges by the cause of the adverse drug event, for those that originated during the stay and those that were present on admission. Clostridium difficile infection: 21.9 originated during the stay and 73.1 were present on admission. Antineoplastic drugs: 7.8 originated during the stay and 49.2 were present on admission. Steroids: 19.7 originated during the stay and 37.3 were present on admission. Anticoagulants: 6.7 originated during the stay and 40.6 were present on admission. Nonsteroidal anti-inflammatory drugs: 5.1 originated during the stay and 28.3 were present on admission. Opiates and Narcotics: 11.2 originated during the stay and 18.8 were present on admission. Other cardiovascular drugs: 5.9 originated during the stay and 21.6 were present on admission. Antibiotics: 12.9 originated during the stay and 12.5 were present on admission. Benzodiazepine: 2.2 originated during the stay and 18.1 were present on admission. Other diuretics: 4.6 originated during the stay and 10.7 were present on admission. Source: Agency for Healthcare Research and Quality, Center for Delivery, Organization, and Markets, Healthcare Cost and Utilization Project, State Inpatient Databases for 32 States, 2011. Across all causes of adverse drug events, there were three times as many ADEs that were present on admission than originated during the stay. Most causes of adverse drug events were more likely to be present on admission. 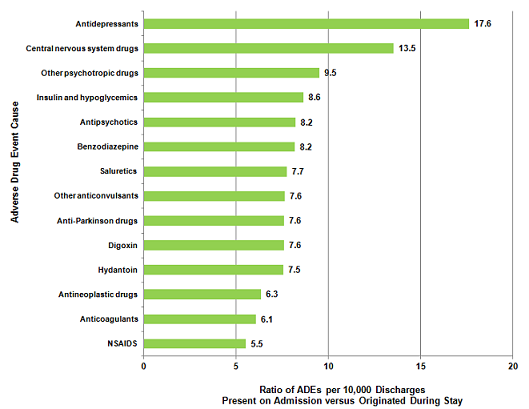 Figure 3 presents the ratio of ADEs per 10,000 discharges that were present on admission versus those that originated during the stay for ADE causes that had at least a 5-fold difference (i.e., the ratio was at least 5.0). Most of the ADE causes had a ratio between 5.0 and 10.0. Only two ADE causes exceeded a ratio of 10.0: ADEs that were due to antidepressants (17.6 times more likely to be POA) and central nervous system drugs (13.5 times more likely to be POA). Only one ADE cause—CNS depressants and anesthetics (data not shown)—was more likely to originate during the hospital stay (4 per 10,000 discharges were present on admission versus 7 per 10,000 discharges originated during the stay). ADEs caused by antibiotics were about equally likely to originate during the stay as to be present on admission (data not shown). Figure 3. Most common causes of adverse drug events present on admission versus those that originated during the stay, 2011. This is a bar graph showing the ratio of adverse drug events per 10,000 discharges present on admission versus those that originated during the stay by the cause of the adverse drug event. Antidepressants, 17.6, Central nervous system drugs, 13.5, Other psychotropic drugs, 9.5, Insulin and hypoglycemics, 8.6, Antipsychotics, 8.2, Benzodiazepine, 8.2, Saluretics, 7.7, Other anticonvulsants, 7.6, Anti-Parkinson drugs, 7.6, Digoxin, 7.6, Hydantoin, 7.5, Antineoplastic drugs, 6.3, Anticoagulants, 6.1, Nonsteroidal anti-inflammatory drugs, 5.5. Source: Agency for Healthcare Research and Quality, Center for Delivery, Organization, and Markets, Healthcare Cost and Utilization Project, State Inpatient Databases for 32 States, 2011. The estimates in this Statistical Brief are based upon data from the Healthcare Cost and Utilization Project (HCUP) 2011 State Inpatient Databases (SID) from 32 States. These States included data elements that designated whether diagnoses were present on admission or originated during the stay: Arkansas, Arizona, California, Colorado, Florida, Georgia, Hawaii, Iowa, Illinois, Indiana, Kansas, Kentucky, Massachusetts, Maryland, Michigan, Minnesota, Montana, Nebraska, New Jersey, Nevada, New York, Oklahoma, Oregon, Pennsylvania, South Carolina, South Dakota, Tennessee, Texas, Virginia, Vermont, Washington, and Wisconsin. The specific causes of adverse drug events presented in this Statistical Brief were based on a review of International Classification of Diseases, Ninth Revision, Clinical Modification (ICD-9-CM) diagnosis codes and external cause of injury codes (E codes). The specific ICD-9-CM codes used for each ADE cause is provided in the separate appendix associated with this Statistical Brief on the HCUP-US website at: http://www.hcup-us.ahrq.gov/reports/statbriefs/sb158_appendix.pdf. Present on admission was determined for each discharge diagnosis based on two types of present-on-admission indicator flags in the SID: (1) a diagnosis-specific flag that indicates whether each diagnosis was present on admission, and (2) an E code flag that indicates whether each external cause of injury was present on admission. A total of 4,554 hospitals and 30,149,145 discharges were in the original SID for the 32 States in this study. Hospitals and individual discharge records with missing or incomplete present-on-admission information were excluded from the analysis, as shown in Table 2.
aSome excluded hospitals and discharges are counted more than once, as a function of meeting more than one exclusion criteria. The final analysis file for this Statistical Brief included 2,737 hospitals (60.1 percent) and 20,172,966 discharges (66.9 percent) across the 32 States. HCUP is a family of powerful health care databases, software tools, and products for advancing research. Sponsored by the Agency for Healthcare Research and Quality (AHRQ), HCUP includes the largest all-payer encounter-level collection of longitudinal health care data (inpatient, ambulatory surgery, and emergency department) in the United States, beginning in 1988. HCUP is a Federal-State-Industry Partnership that brings together the data collection efforts of many organizations—such as State data organizations, hospital associations, private data organizations, and the Federal government—to create a national information resource. The HCUP State Inpatient Databases (SID) are hospital inpatient databases from data organizations participating in HCUP. The SID contain the universe of the inpatient discharge abstracts in the participating HCUP States, translated into a uniform format to facilitate multistate comparisons and analyses. Together, the SID encompass more than 95 percent of all U.S. community hospital discharges in 2011. The SID can be used to investigate questions unique to one State, to compare data from two or more States, to conduct market area variation analyses, and to identify State-specific trends in inpatient care utilization, access, charges, and outcomes. For information on other hospitalizations in the United States, download HCUP Facts and Figures: Statistics on Hospital-Based Care in the United States in 2009, located at http://www.hcup-us.ahrq.gov/reports.jsp. Introduction to the HCUP State Inpatient Databases. Online. December 2012. U.S. Agency for Healthcare Research and Quality. http://hcup-us.ahrq.gov/db/state/siddist/Introduction_to_SID.pdf. Accessed June 24, 2013. Weiss AJ (Truven Health Analytics), Elixhauser A (AHRQ), Bae J (Emory University), Encinosa W (AHRQ). Origin of Adverse Drug Events in U.S. Hospitals, 2011. HCUP Statistical Brief #158. July 2013. Agency for Healthcare Research and Quality, Rockville, MD. http://www.hcup-us.ahrq.gov/reports/statbriefs/sb158.pdf. The authors would like to acknowledge the contributions of Devi Katikineni and Valeriy Bakaushin of Social & Scientific Systems, Inc.
1 National Center for Health Statistics. Health, United States, 2011: With Special Feature on Socioeconomic Status and Health. Hyattsville, MD: Centers for Disease Control and Prevention; 2012. 5 Moore TJ, Cohen MR, Furberg CD. Serious adverse drug events reported to the Food and Drug Administration, 1998–2005. Archives of Internal Medicine 2007;167(15):1752–9. 6 Lucado J, Paez K, Elixhauser E. Medication-Related Adverse Outcomes in U.S. Hospitals and Emergency Departments, 2008. HCUP Statistical Brief #109. April 2011. Agency for Healthcare Research and Quality, Rockville, MD. http://www.hcup-us.ahrq.gov/reports/statbriefs/sb109.pdf. Accessed June 24, 2013. 7 Classen DC, Jaser L, and Budnitz DS. Adverse Drug Events Among Hospitalized Medicare Patients: Epidemiology and National Estimates from a New Approach to Surveillance. The Joint Comm.J. on Quality and Patient Safety. 2010, 36:1, 12-21. 8 Classen DC, Pestotnik SL, Evans RS, et al. Adverse drug events in hospitalized patients. Excess length of stay, extra costs, and attributable mortality. JAMA 1997 Jan 22:277(4):301–6. 9 Lucado J, Paez K, Elixhauser E. Medication-Related Adverse Outcomes in U.S. Hospitals and Emergency Departments, 2008. HCUP Statistical Brief #109. April 2011. Agency for Healthcare Research and Quality, Rockville, MD. http://www.hcup-us.ahrq.gov/reports/statbriefs/sb109.pdf. Accessed June 24, 2013. 10 de Vries EN, Ramrattan MA, Smorenburg SM, Gouma DJ, Boermeester MA. The incidence and nature of in-hospital adverse events: a systematic review. Quality and Safety in Health Care. 2008;17;216–23. 11 Levinson DR. Adverse Events in Hospitals: National Incidence Among Medicare Beneficiaries. Office of Inspector General, Department of Health and Human Services, 2010. OEI-06-09-00090. 12 2010 HCUP ADE origination rates were presented in Encinosa WE and Bae J. Will Meaningful Use Hospital EMR Prevent Hospital-Acquired Drug Events? WHITE Conference, October, 2012. http://www.rhsmith.umd.edu/files/Documents/Centers/CHIDS/events/2013/2013WHITE/2012WHITEProgram.pdf. Accessed August 11, 2013. 13 Houchens, R. Inferences with HCUP State Databases Final Report. HCUP Methods Series Report # 2010-05. Online October 12, 2010. U.S. Agency for Healthcare Research and Quality. http://www.hcup-us.ahrq.gov/reports/methods/2010_05.pdf. Accessed June 24, 2013. 14 Clostridium difficile infection (CDI) often occurs as a complication of antibiotic therapy; ampicillin, clindamycin, third-generation cephalosporins (such as cefotaxime and ceftazidime), and fluoroquinolones are commonly identified as high-risk drugs. From: Blondeau JM. What have we learned about antimicrobial use and the risks for Clostridium difficile-associated diarrhoea? Journal of Antimicrobial Chemotherapy 2009;63(2):230–7. Internet Citation: Statistical Brief #158. Healthcare Cost and Utilization Project (HCUP). May 2016. Agency for Healthcare Research and Quality, Rockville, MD. www.hcup-us.ahrq.gov/reports/statbriefs/sb158.jsp.